Dalarna is often called “Sweden in miniature”. Much of the popular imagery of Sweden, culturally and geographically, is from Dalarna; a pretty red-painted cottage by a glittering lake, in the evening sun, people in brightly-coloured folk costumes dance and swirl in celebration of Midsummer. All very Swedish. All very Dalarna. There is a lot to see and do in Dalarna. Here is just a small sample of what we have to offer. We hope that you are going to enjoy it just as much as we do! 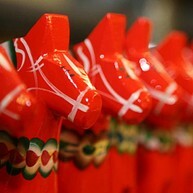 The orange wooden horse decorated with kurbits painting is a Swedish icon from Dalarna. Genuine Dala horses are only made in Dalarna. Pay a visit to Nusnäs, 10 km SE of Mora in and see how this Swedish national symbol is made. And you can even paint your own! The ancestor of today´s Dala horse was born in the 18th century when foresters, who were working away from home, would sit by the fire in dark winter evenings and carve horses for their children at home in the village. The Dala horse is as Swedish as Swedish can be. 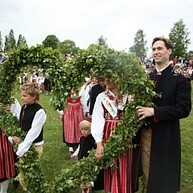 Midsummer is an ancient Swedish tradition that all Swedes celebrate at the summer equinox at the end of June. Come and celebrate Midsummer in the Siljan District, help decorate the maypole with flowers, make wreaths, join in the dancing and sample the festive food. Here you can experience genuine Midsummer celebrations with folk musicians and garlands in almost every little village in the area. Idre Fjäll is located in Sweden´s most southern mountain region in Dalarna. All you need here is comfortable shoes, casual clothes, swimsuits, a good backpack and of course a bike. Cycling on Idre Fjäll is easily accessible from the entire resort, you get on the bike at you cottage door and roll away. We have bike trails that move around Idre Fjäll and the whole family can come along. When the lift is in service you can easily go to the top of the mountain and just enjoy the downhill trails, but remember that it can be just as exhausting even without pedaling. Idre Fjäll also have a newly built Skills area with jumps, drops, pump track, stone steps and balance training. The mining area of the Great Copper Mountain in Falun is a World Heritage site and a must-do when visiting Falun. 70% of the world’s copper was once produced here and can you imagine what the working conditions were like. 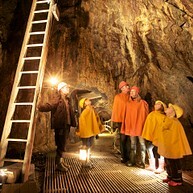 Take the underground guided tour of the Falun Mine and explore 1300 years back in time. 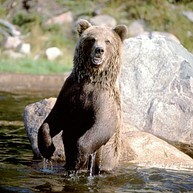 Fulufjället National Park was established in 2002 and covers 385 km2 and is the largest national park in south Sweden. Here you find Sweden's highest waterfall of 93 meters and the world's oldest tree, which is over 9 550 years old! Njupeskär waterfall is 93 meters and thus Sweden's highest. The water falls freely 70 meters. The stream next to the fog case there are many rare mosses, lichens and vascular plants. Many of them require constant moisture to survive. The deep groove cut into the sandstone layers of the waterfall is a textbook example of reverse erosion. A few days around midsummer - at the summer solstice - the sun finds its way to the waterfall and gives it a magical blue light. But this occurs only in the morning between 3:00 to 5:00 am. The hikes on Fulufjället are well marked and the trail to the waterfall is a round trip of 4 km. Grövelsjön is the place where the road ends and the mountains take over. This is the place where the Swedish mountain-chain starts and the hiking opportunities almost get infinite. The walks are from 3 km up to 3 days, were you can either sleep in one of the camps on the mountain or in you own tent. There is also a boat crossing the lake Grövelsjön over to Norway, making it possible to walk back and completing a trip through 2 countries. When hiking, don´t forget to bring a map and good clothes for all weathers. Carl Larsson was and is one of Sweden's best known and loved artists. He lived and worked in France - where he was part of the European artists' collective - and in Sweden, but came back to live in Dalarna in the late 19th century until his death in 1919. 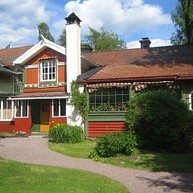 Carl Larsson-gården, the home where he lived with his wife Karin, is a work of art that the couple created together. There are many fish-filled waters here so you can enjoy many different types of fishing. 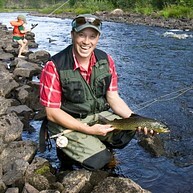 Challenge the pike in one of the lakes or fish for grayling and salomon trout in the mighty Västerdalälven river. Our experienced fishing guides will show you the best fishing waters so that you can catch something extra special to serve for dinner.